Visual summary of paper titles via wordle. The documents distributed by this server have been provided by the contributing authors as a means to ensure timely dissemination of scholarly and technical work on a noncommercial basis. Copyright and all rights therein are maintained by the authors or by other copyright holders, notwithstanding that they have offered their works here electronically. It is understood that all persons copying this information will adhere to the terms and constraints invoked by each author's copyright. These works may not be reposted without the explicit permission of the copyright holder. Other restrictions to copying individual documents may apply. Vasilis Samoladas and Minos Garofalakis. "Functional Geometric Monitoring for Distributed Streams", Proceedings of EDBT'2019, Lisbon, Portugal, March 2019. Ioannis Flouris, Nikos Giatrakos, Antonios Deligiannakis, Minos Garofalakis, Michael Kamp, and Michael Mock. "Issues in Complex Event Processing: Status and Prospects in the Big Data Era", Journal of Systems and Software, 127:217-236, 2017. Minos Garofalakis, Johannes Gehrke, and Rajeev Rastogi (Eds.). 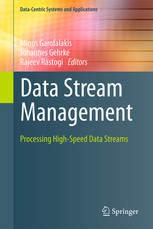 "Data Stream Management -- Processing High-Speed Data Streams", Springer-Verlag, New York (Data-Centric Systems and Applications Series), July 2016 (ISBN 978-3-540-28607-3). Nikos Giatrakos, Antonios Deligiannakis, and Minos Garofalakis. "Scalable Approximate Query Tracking over Highly Distributed Data Streams", Proceedings of ACM SIGMOD'2016, San Francisco, California, June 2016. Ioannis Flouris, Vasiliki Manikaki, Nikos Giatrakos, Antonios Deligiannakis, Minos Garofalakis, Michael Mock, Sebastian Bothe, Inna Skarbovsky, Fabiana Fournier, Marko Štajcer, Tomislav Križan, Jonathan Yom-Tov, and Taji Ćurin. "FERARI: A Prototype for Complex Event Processing over Streaming Multi-Cloud Platforms" (demo paper), Proceedings of ACM SIGMOD'2016, San Francisco, California, June 2016. Ioannis Flouris, Vasiliki Manikaki, Nikos Giatrakos, Antonios Deligiannakis, Minos Garofalakis, Michael Mock, Sebastian Bothe, Inna Skarbovsky, Fabiana Fournier, Marko Štajcer, Tomislav Križan, Jonathan Yom-Tov, and Marijo Volarevic. "Complex Event Processing over Streaming Multi-Cloud Platforms - The FERARI Approach" (demo paper), Proceedings of ACM DEBS'2016, Irvine, California, June 2016. Apostolos Nydriotis, Pavlos Malakonakis, Nikos Pavlakis, Grigorios Chrysos, Ekaterini Ioannou, Euripides Sotiriades, Minos Garofalakis, and Apostolos Dollas. "Leveraging Reconfigurable Computing in Distributed Real-time Computation Systems", Proceedings of BDPR'2016 (EDBT/ICDT Workshops), Bordeaux, France, March 2016. Ekaterini Ioannou and Minos Garofalakis. "Query Analytics over Probabilistic Databases with Unmerged Duplicates", IEEE Transactions on Knowledge and Data Engineering, Vol. 27, No. 8, August 2015. Odysseas Papapetrou, Minos Garofalakis, and Antonios Deligiannakis. "Sketching Distributed Sliding-Window Data Streams", The VLDB Journal, Vol. 24, No. 3, June 2015. Minos Garofalakis. 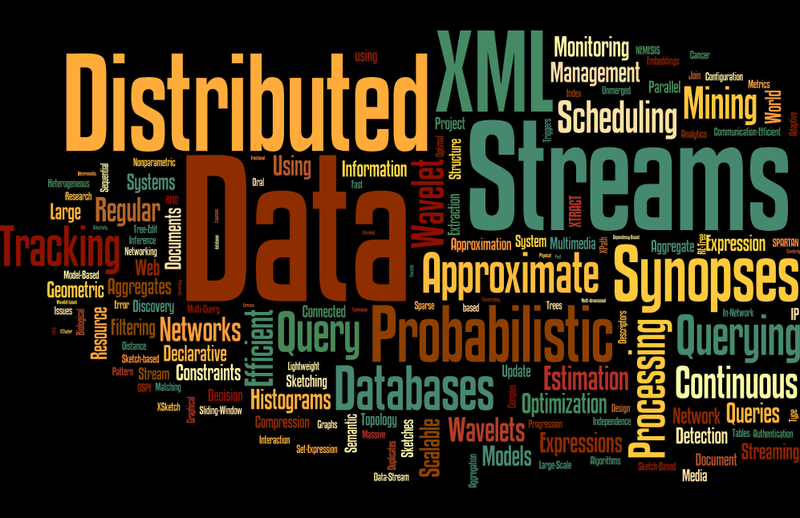 "Approximate Geometric Query Tracking over Distributed Streams", IEEE Data Engineering Bulletin, Vol. 38, No. 3, September 2015 (Special Issue on Approximate Query Processing and Applications), pp. 103-112. Chee-Yong Chan, Minos Garofalakis, and Rajeev Rastogi. "Indexed Regular Expression Matching", Entry in: Encyclopedia of Algorithms (Ming-Yang Kao, Ed. ), Springer, 2015. Odysseas Papapetrou and Minos Garofalakis. "Continuous Fragmented Skylines over Distributed Streams", Proceedings of IEEE ICDE'2014, Chicago, IL, March 2014. Minos Garofalakis. "Querying Big, Dynamic, Distributed Data" (Invited Keynote Talk), Proceedings of DOLAP'2014, Shanghai, China, November 2014. Minos Garofalakis. "Querying Distributed Data Streams" (Invited Keynote Talk), Proceedings of ADBIS'2014, Ohrid, Republic of Macedonia, September 2014. Kalliopi D. Kalantzaki, Ekaterini S. Bei, K. P. Exarchos, Michalis Zervakis, Minos Garofalakis, and D. I. Fotiadis. "Nonparametric Network Design and Analyses of Disease Genes in Oral Cancer Progression", IEEE Journal of Biomedical and Health Informatics, Vol. 18, No. 2, March 2014. Nikos Giatrakos, Antonios Deligiannakis, Minos Garofalakis, Izchak Sharfman, and Assaf Schuster. "Distributed Geometric Query Monitoring using Prediction Models", ACM Transactions on Database Systems, Vol. 39, No. 2, May 2014. Stavros Papadopoulos, Graham Cormode, Antonios Deligiannakis, and Minos Garofalakis. "Lightweight Query Authentication on Streams", ACM Transactions on Database Systems, Vol. 39, No. 4, December 2014. (SIGMOD/PODS'2013 Special Issue). Minos Garofalakis, Daniel Keren, and Vasilis Samoladas. "Sketch-based Geometric Monitoring of Distributed Stream Queries", Proceedings of VLDB'2013 (PVLDB, Vol. 6, No. 10), Trento, Italy, August 2013. Kalliopi D. Kalantzaki, Ekaterini S. Bei, K. P. Exarchos, Michalis Zervakis, D. I. Fotiadis, and Minos Garofalakis. "Identification of altered MET network in Oral Cancer Progression based on Nonparametric Network Design", Proceedings of IEEE EMBC'2013, Osaka, Japan, July 2013. Kalliopi D. Kalantzaki, Ekaterini S. Bei, Minos Garofalakis, and Michalis Zervakis. "Biological Interaction Networks based on Non-Parametric Estimation", International Journal of Biomedical Engineering and Technology, Vol. 13, No. 4, 2013. Stavros Christodoulakis, Minos Garofalakis, Euripides G.M. Petrakis, Antonios Deligiannakis, Vasilis Samoladas, Ekaterini Ioannou, Odysseas Papapetrou, and Stelios Sotiriadis. "Data Management Research at the Technical University of Crete", ACM SIGMOD Record, Vol. 42, No. 4, December 2013. Odysseas Papapetrou, Minos Garofalakis, and Antonios Deligiannakis. "Sketch-based Querying of Distributed Sliding-Window Data Streams", Proceedings of VLDB'2012 (PVLDB, Vol. 5, No. 10), Istanbul, Turkey, August 2012. Nikos Giatrakos, Antonios Deligiannakis, Minos Garofalakis, Izchak Sharfman, and Assaf Schuster. "Prediction-based Geometric Monitoring over Distributed Data Streams", Proceedings of ACM SIGMOD'2012, Scottsdale, Arizona, May 2012. Kalliopi D. Kalantzaki, Ekaterini S. Bei, Minos Garofalakis, and Michalis Zervakis. "Biological Interaction Networks Based on Sparse Temporal Expansion of Graphical Models", Proceedings of IEEE BIBE'2012, Larnaca, Cyprus, November 2012. Daisy Zhe Wang, Michael J. Franklin, Minos Garofalakis, Joseph M. Hellerstein, and Michael L. Wick. "Hybrid In-Database Inference for Declarative Information Extraction", Proceedings of ACM SIGMOD'2011, Athens, Greece, June 2011. Vibhor Rastogi, Nilesh Dalvi, and Minos Garofalakis. "Large-Scale Collective Entity Matching", Proceedings of VLDB'2011 (PVLDB, Vol. 4, No. 4), Seattle, Washington, August 2011. Evangelos E. Papalexakis, Nicholas D. Sidiropoulos, and Minos Garofalakis. 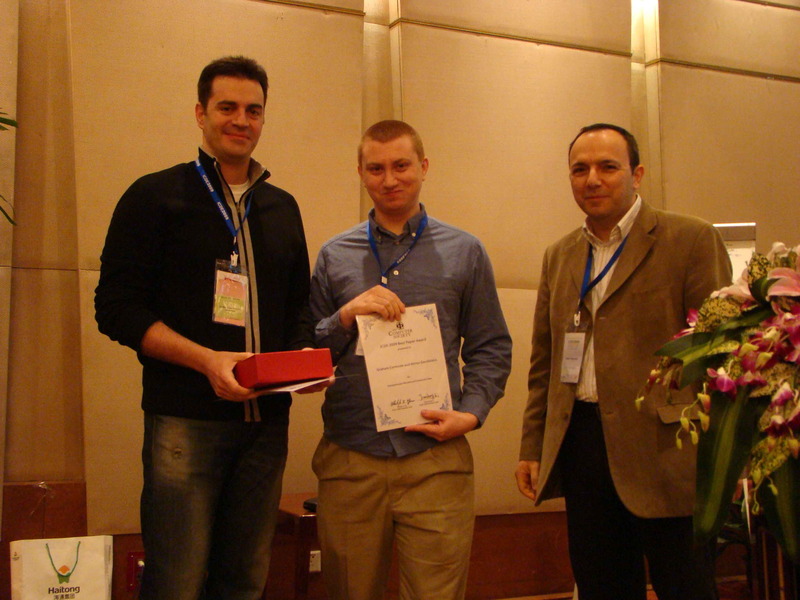 "Reviewer Profiling Using Sparse Matrix Regression", OEDM'2010, Sydney, Australia, December 2010. Graham Cormode and Minos Garofalakis. "Histograms and Wavelets on Probabilistic Data", IEEE Transactions on Knowledge and Data Engineering, 2010 ("Best of ICDE'2009" Special Issue). Boon Thau Loo, Tyson Condie, Minos Garofalakis, David E. Gay, Joseph M. Hellerstein, Petros Maniatis, Raghu Ramakrishnan, Timothy Roscoe, and Ion Stoica. "Declarative Networking", Communications of the ACM (Research Highlights), Vol. 52, No. 11, November 2009. Alin Dobra, Minos Garofalakis, Johannes Gehrke, and Rajeev Rastogi. "Multi-Query Optimization for Sketch-Based Estimation", Information Systems, Vol. 34, No. 2, April 2009. Minos Garofalakis. "Distributed Data Streams", Entry in: Encyclopedia of Database Systems (Ling Liu and M. Tamer Ozsu, Eds. ), Springer, 2009. Minos Garofalakis. "Wavelets on Streams", Entry in: Encyclopedia of Database Systems (Ling Liu and M. Tamer Ozsu, Eds. ), Springer, 2009. Minos Garofalakis. "The Discrete Wavelet Transform and Wavelet Synopses", Entry in: Encyclopedia of Database Systems (Ling Liu and M. Tamer Ozsu, Eds. ), Springer, 2009. Graham Cormode and Minos Garofalakis. "Approximate Continuous Querying over Distributed Streams", ACM Transactions on Database Systems, Vol. 33, No. 2, June 2008. Shawn R. Jeffery, Michael J. Franklin, and Minos Garofalakis. "An Adaptive RFID Middleware for Supporting Metaphysical Data Independence", The VLDB Journal, Vol. 17, No. 2, March 2008 ("Best of VLDB'2006" Special Issue). Graham Cormode and Minos Garofalakis. "Streaming in a Connected World: Querying and Tracking Distributed Data Streams" (tutorial abstract), Proceedings of EDBT'2008, Nantes, France, March 2008. Chee-Yong Chan, Minos Garofalakis, and Rajeev Rastogi. "Regular Expression Indexing", Entry in: Encyclopedia of Algorithms (Ming-Yang Kao, Ed. ), Springer, 2008. Minos Garofalakis and Neoklis Polyzotis. "Very Large Databases", Chapter in: Wiley Encyclopedia of Computer Science and Engineering (Benjamin W. Wah, Ed. ), John Wiley & Sons, Inc., 2008. Rob Ennals, Eric Brewer, Minos Garofalakis, Michael Shadle, and Prashant Gandhi. "Intel Mash Maker: Join the Web", ACM SIGMOD Record, Vol. 36, No. 4, December 2007, pp. 27-33. Yahoo! Research Community Systems Group. "Community Systems Research at Yahoo! ", ACM SIGMOD Record, Vol. 36, No. 3, September 2007, pp. 47-54. Graham Cormode and Minos Garofalakis. "Sketching Probabilistic Data Streams", Proceedings of ACM SIGMOD'2007, Beijing, China, June 2007. Robert Ennals and Minos Garofalakis. "MashMaker: Mashups for the Masses" (demo paper), Proceedings of ACM SIGMOD'2007, Beijing, China, June 2007. Graham Cormode and Minos Garofalakis. "Streaming in a Connected World: Querying and Tracking Distributed Data Streams" (tutorial abstract), Proceedings of ACM SIGMOD'2007, Beijing, China, June 2007. Wei Wang, Minos Garofalakis, and Kannan Ramchandran. "Distributed Sparse Random Projections for Refinable Approximation", Proceedings of IPSN'2007, Cambridge, Massachusetts, April 2007. Yuri Breitbart, Minos Garofalakis, Anupam Gupta, Amit Kumar, and Rajeev Rastogi. "On Configuring BGP Route Reflectors", Proceedings of COMSWARE'2007, Bangalore, India, January 2007. Eirinaios Michelakis, Daisy Zhe Wang, Minos Garofalakis, and Joseph M. Hellerstein. "Granularity Conscious Modeling for Probabilistic Databases", DUNE'2007, Omaha, Nebraska, October 2007. Ling Huang, Minos Garofalakis, Anthony D. Joseph, and Nina Taft. "Approximate Decision Making in Large-Scale Distributed Systems" (poster), Proceedings of MLSys'2007, Whistler, B.C., December 2007. Minos Garofalakis. Kurt P. Brown, Michael J. Franklin, Joseph M. Hellerstein, Daisy Zhe Wang Eirinaios Michelakis, Liviu Tancau, Eugene Wu, Shawn R. Jeffery, and Ryan Aipperspach. "Probabilistic Data Management for Pervasive Computing: The Data Furnace Project", IEEE Data Engineering Bulletin, Vol. 29, No. 1, March 2006 (Special Issue on Probabilistic Data Management), pp. 57-63. Graham Cormode and Minos Garofalakis. "Streaming in a Connected World: Querying and Tracking Distributed Data Streams" (tutorial abstract), Proceedings of VLDB'2006, Seoul, Korea, September 2006. Neoklis Polyzotis and Minos Garofalakis. "XCluster Synopses for Structured XML Content", Proceedings of ICDE'2006, Atlanta, Georgia, April 2006. Ling Huang, Minos Garofalakis, Joseph M. Hellerstein, Anthony D. Joseph, and Nina Taft. "Toward Sophisticated Detection with Distributed Triggers", Proceedings of MineNet'2006, Pisa, Italy, September 2006. Minos Garofalakis and Amit Kumar. "Wavelet Synopses for General Error Metrics", ACM Transactions on Database Systems, Vol. 30, No. 4, December 2005 (SIGMOD/PODS'2004 Special Issue). Minos Garofalakis and Amit Kumar. "XML Stream Processing Using Tree-Edit Distance Embeddings", ACM Transactions on Database Systems, Vol. 30, No. 1, March 2005 (SIGMOD/PODS'2003 Special Issue), pp. 279-332. Graham Cormode and Minos Garofalakis. "Efficient Strategies for Continuous Distributed Tracking Tasks", IEEE Data Engineering Bulletin, Vol. 28, No. 1, March 2005 (Special Issue on In-Network Query Processing), pp. 33-39. David Maier, Peter A. Tucker, and Minos Garofalakis. "Filtering, Punctuation, Windows and Synopses", Chapter in: Stream Data Management (N. Chaudhry, K. Shaw, M. Abdelguerfi, Eds. ), Springer (Advances in Database Systems Series), 2005. Minos Garofalakis and Phillip B. Gibbons. "Probabilistic Wavelet Synopses", ACM Transactions on Database Systems, Vol. 29, No. 1, March 2004 (SIGMOD/PODS'2002 Special Issue), pp. 43-90. Sumit Ganguly, Minos Garofalakis, and Rajeev Rastogi. "Tracking Set-Expression Cardinalities over Continuous Update Streams", The VLDB Journal, Vol. 13, No. 4, December 2004 (Special Issue on Data Stream Processing), pp. 354-369. Yuri Breitbart, Minos Garofalakis, Ben Jai, Cliff Martin, Rajeev Rastogi, and Avi Silberschatz. "Topology Discovery in Heterogeneous IP Networks: The NetInventory System", IEEE/ACM Transactions on Networking, Vol. 12, No 3, June 2004, pp. 401-414. Neoklis Polyzotis, Minos Garofalakis, and Yannis Ioannidis. "Selectivity Estimation for XML Twigs", Proceedings of IEEE ICDE'2004, Boston, Massachusetts, March 2004, pp. 264-275. Wenfei Fan, Minos Garofalakis, Ming Xiong, and Xibei Jia. "Composable XML Integration Grammars", Proceedings of ACM CIKM'2004, Washington, D.C., November 2004, pp. 2-11. Minos Garofalakis, Ioana Manolescu, Marco Mesiti, George Mihaila, Ralf Schenkel, Bhavani Thuraisingham, and Vasilis Vassalos. "What's Next in XML and Databases?" (Panel Abstract, DataX'2004 Workshop), In: Current Trends in Database Technology -- EDBT 2004 Workshops, Springer-Verlag Lecture Notes in Computer Science (LNCS), Vol. 3268/2004, pp. 318-324. Natasha Drukh, Neoklis Polyzotis, Minos Garofalakis, and Yossi Matias. "Fractional XSketch Synopses for XML Databases", Proceedings of XSym'2004, Toronto, Canada, August 2004. Chee-Yong Chan, Minos Garofalakis, and Rajeev Rastogi. "RE-Tree: An Efficient Index Structure for Regular Expressions", The VLDB Journal, Vol. 12, No. 2, August 2003 ("Best of VLDB'2002" Special Issue), pp. 102-119. Rajeev Rastogi, Yuri Breitbart, Minos Garofalakis, and Amit Kumar. "Optimal Configuration of OSPF Aggregates", IEEE/ACM Transactions on Networking, Vol. 11, No. 2, April 2003, pp. 181-194. Minos Garofalakis, Aristides Gionis, Rajeev Rastogi, S. Seshadri, and Kyuseok Shim. "DTD Inference from XML Documents: The XTRACT Approach" , IEEE Data Engineering Bulletin, Vol. 26, No. 3, September 2003 (Special Issue on Structure Discovery), pp. 18-24. Minos Garofalakis, Dongjoon Hyun, Rajeev Rastogi, and Kyuseok Shim. "Building Decision Trees with Constraints", Data Mining and Knowledge Discovery, Vol. 7, No. 2, April 2003, pp. 187-214. Minos Garofalakis, Aristides Gionis Rajeev Rastogi, S. Seshadri, and Kyuseok Shim. "XTRACT: Learning Document Type Descriptors from XML Document Collections", Data Mining and Knowledge Discovery, Vol. 7, No. 1, January 2003, pp. 23-56. Pascal Felber, Chee-Yong Chan, Minos Garofalakis, and Rajeev Rastogi. "Scalable Filtering of XML Data for Web Services", IEEE Internet Computing, Vol. 7, No. 1, January/February 2003, pp. 49-57. Yigal Bejerano, Yuri Breitbart, Minos Garofalakis, and Rajeev Rastogi. "Physical Topology Discovery for Large Multi-Subnet Networks", Proceedings of IEEE INFOCOM'2003, San Francisco, California, April 2003, pp. 342-352. Chee-Yong Chan, Pascal Felber, Minos Garofalakis, and Rajeev Rastogi. "Efficient Filtering of XML Documents with XPath Expressions", The VLDB Journal, Vol. 11, No. 4, December 2002 (Special Issue on XML Data Management), pp. 354-379. Minos Garofalakis, Rajeev Rastogi, and Kyuseok Shim. "Mining Sequential Patterns with Regular Expression Constraints", IEEE Transactions on Knowledge and Data Engineering, Vol. 14, No. 3, May/June 2002, pp. 530-552. Minos Garofalakis, Yannis Ioannidis, Banu Özden, and Avi Silberschatz. "Competitive On-line Scheduling of Continuous-Media Streams", Journal of Computer and Systems Sciences, Vol. 64, No. 2, March 2002, pp. 219-248. Shivnath Babu, Minos Garofalakis, and Rajeev Rastogi. "SPARTAN: Using Constrained Models for Guaranteed-Error Semantic Compression", SIGKDD Explorations, Vol. 4, No. 1, June 2002 (Special Issue on Constraints in Data Mining), pp. 11-20. Neoklis Polyzotis and Minos Garofalakis. "Structure and Value Synopses for XML Data Graphs", Proceedings of VLDB'2002, Hong Kong, China, August 2002, pp. 466-477. Neoklis Polyzotis and Minos Garofalakis. "Statistical Synopses for Graph-Structured XML Databases", Proceedings of ACM SIGMOD'2002, Madison, Wisconsin, June 2002, pp. 358-369. Alin Dobra, Minos Garofalakis, Johannes Gehrke, and Rajeev Rastogi. "Processing Complex Aggregate Queries over Data Streams", Proceedings of ACM SIGMOD'2002, Madison, Wisconsin, June 2002, pp. 61-72. Rajeev Rastogi, Yuri Breitbart, Minos Garofalakis, and Amit Kumar. "Optimal Configuration of OSPF Aggregates", Proceedings of IEEE INFOCOM'2002, New York City, New York, June 2002, pp. 874-882. Chee-Yong Chan, Pascal Felber, Minos Garofalakis, and Rajeev Rastogi. "Efficient Filtering of XML Documents with XPath Expressions", Proceedings of IEEE ICDE'2002, San Jose, California, February 2002, pp. 235-244. Minos N. Garofalakis, Johannes Gehrke, and Rajeev Rastogi. "Querying and Mining Data Streams: You Only Get One Look" (tutorial abstract), Proceedings of ACM SIGMOD'2002, Madison, Wisconsin, June 2002, pp. 635. Minos Garofalakis, and Rajeev Rastogi. "Network Data Mining and Analysis: The NEMESIS Project" (Invited Industrial Paper), Proceedings of PAKDD'2002, Taipei, Taiwan, May 2002, pp. 1-12. Kaushik Chakrabarti, Minos Garofalakis, Rajeev Rastogi, and Kyuseok Shim. "Approximate query processing using wavelets", The VLDB Journal, Vol. 10, No. 2-3, September 2001 ("Best of VLDB'2000" Special Issue), pp. 199-223. Shivnath Babu, Minos Garofalakis, and Rajeev Rastogi. "SPARTAN: A Model-Based Semantic Compression System for Massive Data Tables", Proceedings of ACM SIGMOD'2001, Santa Barbara, California, May 2001, pp. 283-294. Amol Deshpande, Minos Garofalakis, and Rajeev Rastogi. "Independence is Good: Dependency-Based Histogram Synopses for High-Dimensional Data", Proceedings of ACM SIGMOD'2001, Santa Barbara, California, May 2001, pp. 199-210. Yuri Breitbart, Chee-Yong Chan, Minos Garofalakis, Rajeev Rastogi, and Avi Silberschatz. "Efficiently Monitoring Bandwidth and Latency in IP Networks", Proceedings of IEEE INFOCOM'2001, Anchorage, Alaska, April 2001, pp. 933-942. Amol Deshpande, Minos Garofalakis, and Michael I. Jordan. "Efficient Stepwise Selection in Decomposable Models", Proceedings of UAI'2001, Seattle, Washington, August 2001. Shivnath Babu, Minos Garofalakis, Rajeev Rastogi, and Avi Silberschatz. "Model-Based Semantic Compression for Network-Data Tables", Proceedings of NRDM'2001, Santa Barbara, California, May 2001. Minos Garofalakis and Rajeev Rastogi. "Data Mining Meets Network Management: The NEMESIS Project", Proceedings of DMKD'2001, Santa Barbara, California, May 2001. Minos Garofalakis and Rajeev Rastogi. "Scalable Data Mining with Model Constraints", SIGKDD Explorations, Vol. 2, No. 2, December 2000 (Special Issue on Scalable Data Mining), pp. 39-48. Minos Garofalakis, Dongjoon Hyun, Rajeev Rastogi, and Kyuseok Shim. "Efficient Algorithms for Constructing Decision Trees with Constraints", Proceedings of ACM SIGKDD'2000, Boston, Massachusetts, August 2000, pp. 335-339. Yuri Breitbart, Minos Garofalakis, Cliff Martin, Rajeev Rastogi, S. Seshadri, and Avi Silberschatz. "Topology Discovery in Heterogeneous IP Networks", Proceedings of IEEE INFOCOM'2000, Tel-Aviv, Israel, March 2000, pp. 265-274. Minos N. Garofalakis and Renée J. Miller. "Very Large Databases", Chapter in: Wiley Encyclopedia of Electrical and Electronics Engineering (John G. Webster, Ed. ), Volume 23, pp. 133-139, John Wiley & Sons, Inc., 1999. Minos N. Garofalakis, Rajeev Rastogi, S. Seshadri, and Kyuseok Shim. "Data Mining and the Web: Past, Present and Future" (Invited Paper), Proceedings of WIDM'99, Kansas City, Missouri, November 1999, pp. 43-47. Minos N. Garofalakis, Sridhar Ramaswamy, Rajeev Rastogi, and Kyuseok Shim. "Of Crawlers, Portals, Mice, and Men: Is there more to Mining the Web?" (Panel Abstract), Proceedings of ACM SIGMOD'99, Philadelphia, Pennsylvania, May 1999, pp. 504. Minos N. Garofalakis, Banu Özden, and Avi Silberschatz. "On periodic resource scheduling for continuous-media databases", The VLDB Journal, Vol. 7, No. 4, December 1998 (Special Issue on Multimedia Databases), pp. 206-225. Minos N. Garofalakis. "Query Scheduling and Optimization in Parallel and Multimedia Databases", PhD Thesis, University of Wisconsin - Madison, August 1998. Minos N. Garofalakis, Banu Özden, and Avi Silberschatz. "On Periodic Resource Scheduling for Continuous Media Databases", Proceedings of IEEE RIDE'98, Orlando, Florida, February 1998, pp. 111-120. Minos N. Garofalakis and Yannis E. Ioannidis. "Scheduling Issues in Multimedia Query Optimization", ACM Computing Surveys, Vol. 27, No. 4, December 1995 (Symposium on Multimedia), pp. 590-592.